The Details: Utena is one of the most bizarre, beautiful, and malicious series. And it's one of my favourites. Unfortunately it is an expensive favourite, so the bulk of my collection revolves around Mikage Souji. 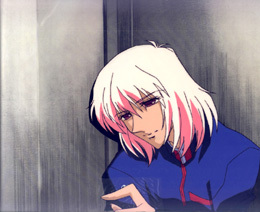 Not that he's cheap, but amongst a large assortment of severely troubled and neurotic humans he's the one with the saddest history (not counting Anthy, who I do actually wish I could afford a nice long-haired cel of). A trait which inevitably seems to lead to me swooning over characters. So I'm a bleeding heart. 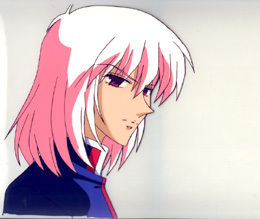 Here's a few of my Mikage Souji cels and now, finally, one of Touga as well. 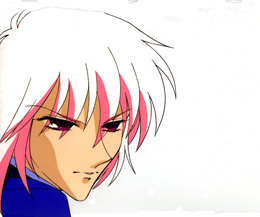 I'm hoping adding the Touga will help me feel up for making this more of a series page than a Mikage page. All of the Mikage cels are from the final Black Rose episode. You might want to avoid reading the text if you haven't yet seen The Black Rose Saga. Comments: After Mikage invites Utena to his Mikage Seminar for the second time, and comments that it's there to help anyone who is in trouble, he turns to look at her as she explains that she is not in any trouble and does not need any help. That's our oblivious Utena! Her words at this very moment are that Chuchu would come with her and scatter crumbs all over the Nemuro Memorial Hall floor. Mikage is in the early phases of his delusions of Utena being Tokiko here, and (thinks he) sees Tokiko when he finishes turning his head. Comments: Mikage, shortly before his delusions start getting a bit too powerful during his duel with Utena. He says "You're such a stubborn girl, Tokiko. Seems you won't understand unless I destroy that rose." and then attacks again, this cel is from the flurried movement of that particular round of sparring. It's difficult to catch without a freeze frame. Moments after this, Mikage truly sees Mamiya in the pictures. Comments: The #2 womanizer of the series (Akio obviously gets 1st place). 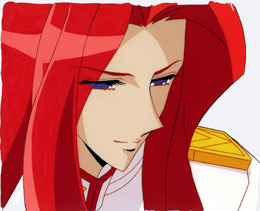 This is definitely Touga's schmoozy look... Which narrows it down to one of the 100s of times he charms, or tries to charm, a girl during the series, right? Which also basically narrows it down to most of the episodes he appears in. Hrm. Pretty cel, though, and nice see-through hair.